If you run a retail store or attend exhibitions where you need to regularly change and update your displays then you’ll understand how difficult and sometimes messy it can be. We have developed a magnetic solutions which allows for quick and easy changing of point of sale displays, posters and even graphics which cover an entire wall. 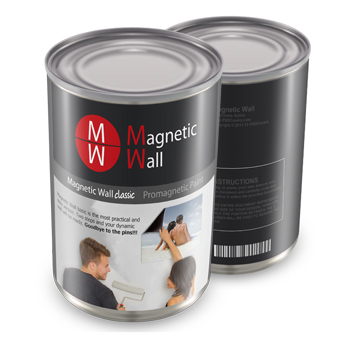 ProMagnetic Paint is one half of our Magnetic Wall Classic and Pro Premium solution. You simply paint your wall or surface with our magnetic paint, and smoothly stick on your printed magnetic display. The magnetic quality allows you to easily remove existing sheets and replace them. You can print directly onto our magnetic rolls to achieve to create your magnetic graphics. You don’t need large printed graphics to cover the wall, if you wish, after applying the magnetic paint, you can simply paint over it with a colour of your choice to produce a magnetically-receptive wall. This allows you to stick magnetic prints and materials directly onto the wall.